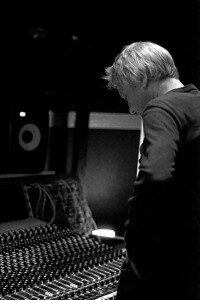 Pete Smith has been involved in the music industry for the past 30 years. He started his career in 1979 as an engineer at Utopia Studios working with such acts as The Boomtown Rats, The Police, Stevie Wonder, Joan Armatrading, Cheryl Crow, Alex Harvey, Spandau Ballet, Doll by Doll, Van Morrison, Light of the World, Central Line, Duran Duran, Landscape, Orange Juice and many more. During his time there he gained great experience of audio engineering and song construction which eventually lead into production. Since that time he has been actively involved in producing and engineering records. He first met with Sting during the making of the demos of the Synchronicity album which led to the mixing of the Live in Atlanta video for the Police. He started his production career with Sting in the mid eighties on his first solo record – the Grammy nominated The Dream of the Blue Turtles. He and Sting eventually won a Grammy for the live recording of the same album. This led on to various other records…some of which are listed below. During recent years he has worked extensively in both England and Europe. European successes include Sasha and Randy Crawford in Germany and Dicte and Anna Faroe in Denmark. He is currently working with debut country artist Robert Vincent from Liverpool.